This morning I received a text from an old friend who happened to be in town. He wondered if I would like to go for a ride. Any chance to go for a ride with an old triathlon buddy is as good a reason as I need. So we met up and headed out for a 40 mile ride. Nothing fast, just some nice saddle time and conversation to catch up. Definitely looking forward to more rides in the future with this guy! Finished the day with coaching the swim kids and fueling up for another full day tomorrow! Workout: Rode 43.1 Miles used Acid Check Granules and Himalayan Pink Salt. Disclaimer: As a triathlete, I am not always eating with the intention of weight loss but rather to maintain weight and fuel my activity. If you are not as active as I am, please don’t use my nutritional intake as your model. If you would like help finding out a meal plan and workouts that would be good for you, please don’t hesitate to text or call me at 775-722-8184 or Facebook me at www.facebook.com/fityak. Looking forward to hearing from you! Started off the day with 1 1/2 hours of Hot Yoga! Vinyasa Flow is supposed to leave you feeling grounded, calm, and free of tension after a sequence of poses flowing from one to the next. This was the first time that I have taken this class and I can attest to the fact that it will leave you calm and free of tension. Adding the heat helped with my flexibility but overall it just made the workout that much more intense. Its been a while since I have done any Yoga and after I that was done. All I wanted to do was prop myself up into a recliner, drink water, and watch Stage 7 of the Tour de France. So thats what I did 🙂 at least for a little bit while I gathered up the energy to head out for a ride. By that time came around it was about 97 degrees. Not super hot, but hot enough for sure. Today’s ride was intended to be at moderate intensity. I felt petty relaxed after Yoga and didn’t want to push it too hard leading into the weekend, but best intentions, you know, I was feeling good so I decided to push the pace a bit and try to maintain about 90% and focus on breathing, hydration, and performance in a hot environment. It worked out good. I ended up turning out my fastest time for one of my favorite Strava segments in over a year. Its nice to be hitting some good times again and settling back in to my old Trek. 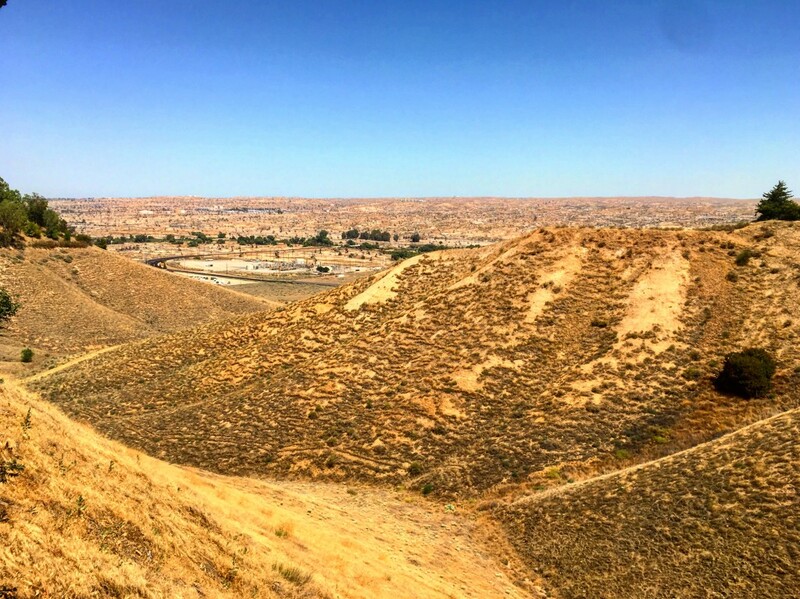 Something that I have realized since I was a kid, growing up in Bakersfield (which can reach very hot and very cold temperatures for California) and competing in different cities around the US, is that working out in the heat at a high intensity prepares me to perform at a higher level during races which are typically held in the morning when temperatures are much cooler. My theory has been that if I can work hard and maintain a high level of output in temperatures of 100 degrees plus, then I should be able to maintain that same high level of output or better when the temperatures are lower. In essence pushing my body to some type of threshold preparing me to acclimate and adapt to various environments. Now I am fully aware that in hotter environments an athlete (or anyone for that matter) needs to hydrate and replace electolytes while exercising. Obviously in a hotter environment this is even more important and not doing so could prove to be dangerous. So while I exercise in these onditions I make sure that I take enough water with supplements to keep me hydrated and safe. So far this theory has proved to be useful since I was in Triathlons and Cross Country as a young athlete and today in my training as an older age group triathlete. I have found various articles and even a study that backs up my findings. I just ask that if you begin to employ this practice in your training, be smart about it, take plenty of hydration and electrolytes to sustain the planned workout, and listen to your body. If you begin to feel light headed, or stop sweating, or feel anything other how you think you should be feeling, take a break, find shade, and don’t feel bad if you need to call someone to come and pick you up. No training is worth risking your health. So train hard, but train smart as well! Workout: Rode 28.4 Miles used Acid Check Granules and Himalayan Pink Salt. Today was a good day. It began with a good night’s sleep (the body recovers during sleep). Woke up to a good cup of coffee, my favorite breakfast shake, the Tour de France, and then a morning ride. I came home to finish watching the Tour and have some lunch. Practice was good tonight. My group is Age Group Performance and today we focused on the Butterfly. The kids worked very hard on the mechanics of this stroke and in turn it takes a bunch of energy out of them. But they did a great job and I am looking forward to seeing them on Monday to work on some more! I finished up the night with some good Mexican food and a frozen yogurt. Pretty good day! Looking forward to another good day tomorrow! Starting off with some Hot Yoga! Workout: Rode 36.2 Miles used Acid Check Granules and Himalayan Pink Salt. The last seven days have not gone per plan from a training perspective. When I get pain anywhere around my joints I seem to get a bit conservative. I have been pushing myself to go a little faster than I probably should with the cycling. And the Insanity Max 30 has me jumping a little more than I want to at my current weight. And really I shouldn’t be doing Speed Power Jumps for my training at this point anyways. There really is no point. Running would be less pounding than those. So After some good foam rolling days and taking it easy with the cross training for this past week, I should be able to resume the workouts as scheduled. Only this time I am choosing to modify the workouts a bit during the power jump segments. I should be able to perform slow, singular power jumps where I can focus on a nice absorptive landing. Unfortunately doing successive rapid power jumps isn’t great on my knees and I don’t think I can handle having to spend another week recovering with tight IT Band issues. The whole point of this is when you feel something isn’t right with your body, listen to your body and change what you are doing. In my case, I wasn’t foam rolling at all like I used to and I almost paid the price. I am just glad that I avoided an injury this time. All I know is that the foam roller is going to be a welcome part of my life and I’ll never stray again! Additionally, I am so happy to have been able to get into the pool and use the BowSwim to workout and also jump into the pool with the kids I coach. I love the non-impact workout from the pool. And now that I have the BowSwim to make my workouts more productive, I cant wait to see how it is going to translate into my open water swimming at my first triathlon back at some point this Summer. Workout: 15 Minutes on BowSwim Finished up 22 Days of Pushups www.22kill.com. Dinner: Fajitas – Chicken, Beef, and Shrimp, Beans and Rice, Chips and Guacamole. Dinner: Chicken and Filet Mignon, Rice, and Vegetables Teppan Style, Mint Chip Ice Cream for Dessert. Cycling, Recovery, The Tour de France, and a Little Bit of Luck! Thursday morning I woke up with a little twinge in my knee. Most likely from a speed jumping interval during Insanity Max 30 and a tight IT Band. I’ll have to take care of that this weekend with some foam rolling. But on this day, I decided to take advantage of my parents’ wanting to spend some time with the kids to meet with a company for an interview (call back for second interview next week) an to get some much needed saddle time before swim practice. 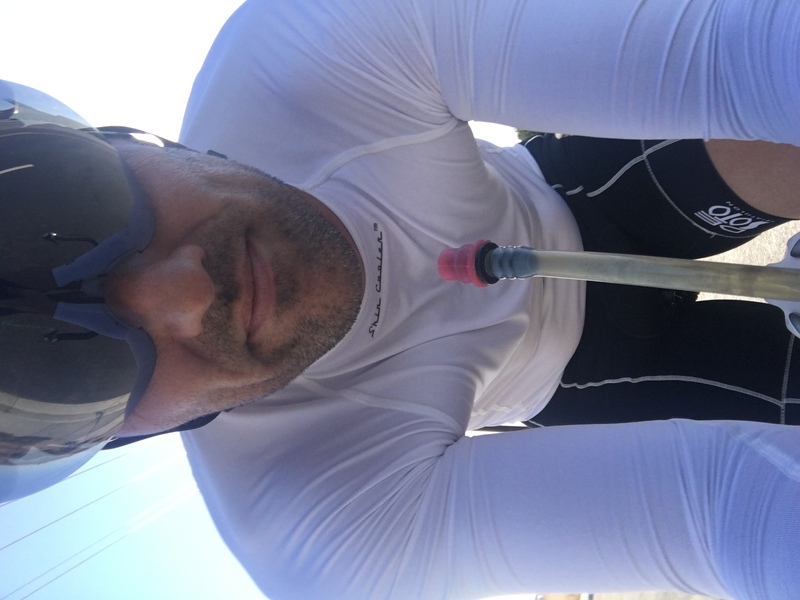 One of my favorite training sessions is to go for a bike ride in the heat of the day. At temperatures over 100 I am good for about 25 Miles. I know about how much water I need to ingest during this time, about 3 ozs per mile, to keep myself from getting too dehydrated. So I loaded up the bike with 72 ozs and headed out for one of my favorite 26 mile rides. Since I have hooked back up with De Soto Sport, I have picked up some new cycling/triathlon apparel to try out. De Soto makes this line of products called Skin cooler™ SDS, this fabric helps keep you cool when you sweat or drench it with water. The ride went good and I had a few decent efforts – both in the first half – I kept hydrated and relatively cool wearing the long sleeve skin cooler top and the skin cooler helmet beanie. These products work really well. The temp opped out at 102 today but I am pretty sure with the reflection off the blacktop it was at least 10 degrees hotter. To give you an idea with some basic math, I weighed in at 179 before starting the ride. I consumed about 4.5 lbs of water. When I got back to the house 1 hour and 16 minutes later, I weighed 177.5 lbs. It left me a little dehydrated after that ride so I grabbed some water bottles and headed up to Bakersfield Aquatics Club (BAC) for swim practice and jumped in with the kids for a few turns in the pool. After practice we had a coaches meeting and enjoyed an awesome dinner with new friends and we talked about BAC and what’s in store for us as a Team. Pretty excited to be a part of this group. The kids are in store for some great things! On another high note, I received an email related to a job application I sent in and it requested me to come to an oral exam interview in a couple weeks! Pretty exciting stuff! Friday I woke up and was pretty dehydrated and my knee was really tight. I knew that I wasn’t going to be working out this day. Sometimes recognizing that taking a recovery day is just as important as a really strong workout. Lots of hydration and Insanity Max 30: Pulse which is an active recovery workout. Cool thing is I spent about an hour talking to a recruiter about a position they are trying to fill and it resulted in setting up a meeting for Tuesday. I have to say that I am feeling lucky and excited about all of these opportunities finally showing up, but I need to stay centered and composed. Nothing is set in stone and I am very thankful for these chances and hopeful that they translate into choices very soon. Today was a mellow day. The Tour de France started this morning, so of course I had to watch that! It was awesome to see Mark Cavendish finally pick up the Yellow Jersey after all of these years and stage wins. Congratulations! I installed a new BowSwim in our pool. The kids a re super excited! And I am too! I got to do a quick 10 minute swim on it and it killed me. Swimming under direct tension like that is such a great workout! Ended the evening with an awesome dinner with the family and finishing it of with my 19th Day of push-ups for www.22kill.com. Happy Training! And have a Happy 4th of July weekend! Workout: Rode 26.3 Miles used Acid Check Granules, Beachbody Performance Hydrate and Energize mixed in water. Workout: 10 Minute Freestyle on Bowswim. Today was a busy day. Its no secret that I have been looking for a new job. The substituting gig was over at the end of May and coaching the kids up at Bakersfield Aquatics Club (BAC) is the only thing keeping me going right now. So yeah you could say that applying to jobs in the hopes of getting at least an interview is a high priority for me right now. Unfortunately Bakersfield hasn’t been giving out much love to me in the way of options. I either have too much experience or not enough, or ridiculously over-qualified so they don’t want to “waste their time” and hire someone who may just leave as soon as they find something better. I don’t know how to change that mentality but I am open to suggestions. Any one? All I want to do is work and provide for my family anyway I can at this point. USC Grad, MBA, 18 years and $500 Million in Construction Management experience, and it seems that I am un-hirable. Whatever, I am not going to let it get me down. I had and interview today, an invitation to come back, and I sent off another application I received in the mail today. So all in all I am doing the stuff I need to do to find the opportunity that is meant for me. The only thing I am bummed about is the fact that I didn’t get to go for a ride in this crazy heat we have been having here in Bakersfield. I had a conversation with our new head coach today at BAC (he’s a transplant from Kentucky) that I like riding in this heat. He said 104? I said yes because if I can perform efficiently in this heat then I can do really well at 75 degrees. He understood that logic. At least i got in my Insanity Max 30 workout and a good little swim with the kids. All in all the day went pretty well! My kids enjoyed their their time with my grandparents and their new puppy, we had a good dinner, spent some good quality time with the kids, and watched some awesome swimming by our new Olympians, and some old ones too! Workout: Insanity Max 30: Sweat Intervals (I didn’t max out but sweated quite a bit) used Acid Check Granules, Beachbody Performance Hydrate and Energize mixed in water. Dinner: Ate the kids’ leftovers, Steak Fajitas, Pinto Bean, Rice, piece of Quesadilla, Guacamole and Chips. Recovery: Foam Rolling with Rumble Roller while watching Swimming. A much needed quiet day at home with the kiddos. We watched a few movies. ET: The Extra Terrestrial was one of them. Been a while since I have seen that one. Finally saw Furious 7 too. Sad. Nice to spend some time with the kids. Way too hot to venture outside for any length of time but we ran a few necessary errands anyway. With so much going on I was still able to find some time to get in my Insanity Max 30 workout in 😉 Good thing too. Almost too hot to workout outside. We piled in the car and headed up to swim practice. I was melting on the deck so I decided to cash in on a perk of being a swim coach. I jumped into the pool and swam around while coaching the kids. Great way to cool down, and the kids like it when you get down into the pool and get on their level. After swim practice we were starving and grabbed some dinner at Baja Fresh. It was yummy! Had to fuel up for tomorrow’s workout and possible afternoon heat ride. We hurried home for showers and to check out the Olympic Swimming Trials. Pretty neat watching some these amazing athletes after coaching some amazing kids who have the dreams of being at the trials and Olympics themselves. Even cooler to think that I may be coaching a kid who could grow up to be an Olympic Athlete. Makes me proud! Finally, I did my 22 pushups. And now its time for bed! Big day tomorrow! Workout: Day 3 of Week 2 Insanity Max 30: Tabata Power (Maxed Out at 20:14) used Acid Check Granules, Beachbody Performance Hydrate and Energize mixed in water. Dinner: Chicken, Pinto Bean, Cheese, and Pico De Gallo, Burrito, Guacamole and Chips, and Root Beer. Post-Workout: 3 – The Final 3 Capsules for Recovery, 8 ozs of Vanilla Yogurt, and lots of water! Started off the day with breakfast and my kids. 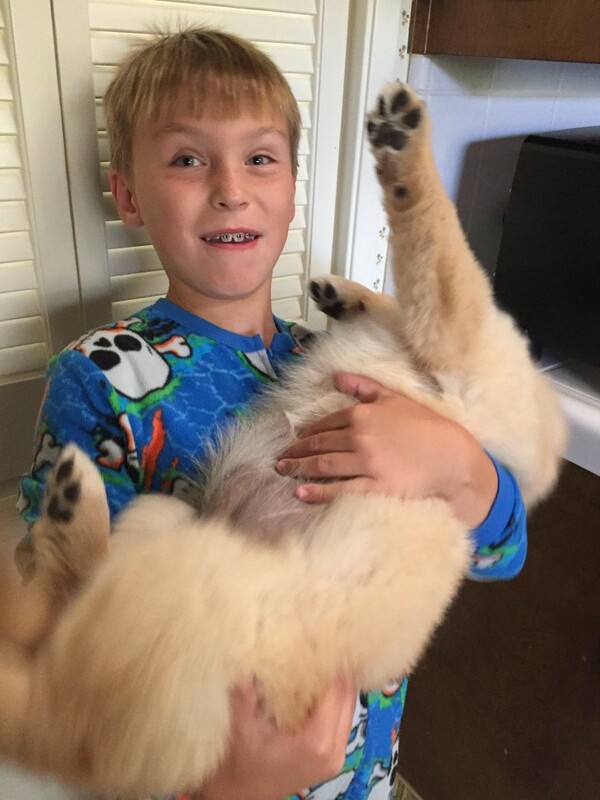 Then we headed up to my parents’ house so that the kids could meet the new puppy. Addison and Davis couldn’t believe how fluffy Sofia is to the touch. They said she was fluffy and chubby. Definitely a happy puppy. I’ll give them that, and they can keep the puppy breath too! Davis found a new friend for sure! and the chore was done. Then it was off to my house to meet the exterminator and get in Day 1 of Week 2 for Insanity Max 30. The workout today was Cardio Challenge. 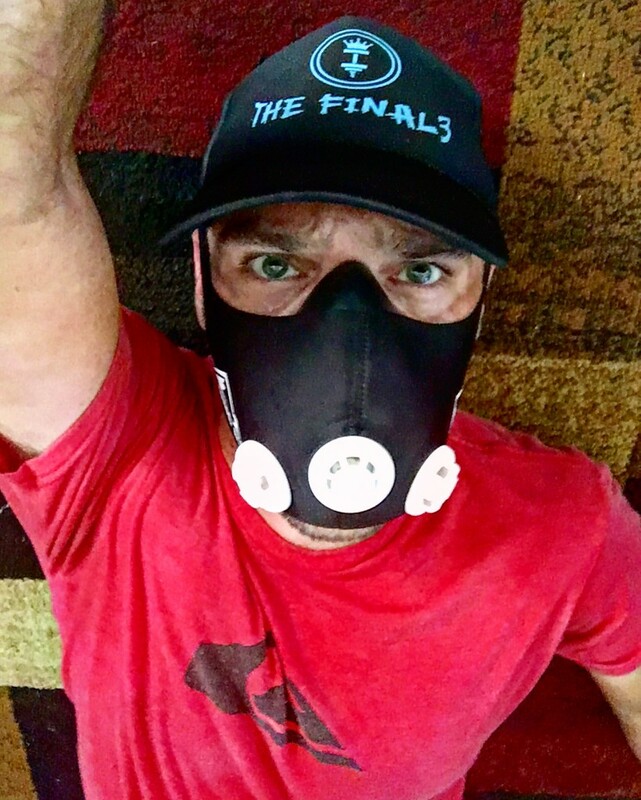 Since I have been able to make it through this workout a few times now without having to stop, I decided to use the Elevation Training Mask to make me have to restrict my airflow. Somehow I managed to make it through the workout, but it definitely made it more difficult. Since I am taking the AB Maximizer option for this workout program, there was an additional 10 minute ab workout. This workout is rough and I ended up having to pause after 2 minutes and 40 seconds. This workout will be added to all of the Cardio days for the program. I headed back to get the kids for swim practice. 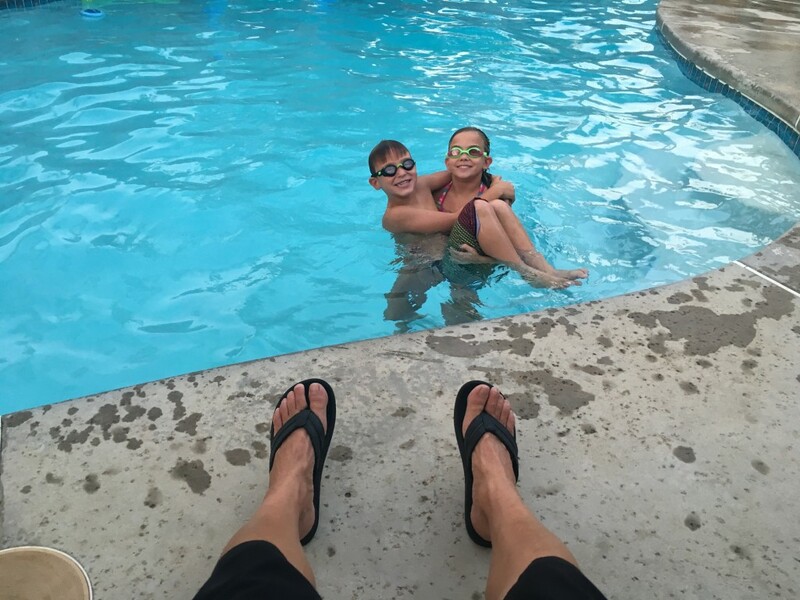 They were still tired from their 2 week vacation, but I convinced them that they needed to get back into the pool and that they would have fun! I was glad to get back to the deck too. I love coaching these kids and hearing their stories from the weekend. After practice we headed to Salty’s BBQ – Yum – for dinner and home to eat. We watched San Andreas. I did my 22 pushups. And now its time for bed! Workout: Day 2 of Insanity Max 30: Cardio Challenge (Wore Elevation Training Mask simulated to +3000ft – Didnt Max Out) followed by Ab Attack (Maxed out at 2:40), used Acid Check Granules, Beachbody Performance Hydrate and Energize mixed in water. A perfect Ending to the Weekend! Its a Rest Day. I thought about working out. But thats about as close as I got. I was too excited that my kids were coming back today. Had to make sure everything was ready! They got back this evening and it was straight to the pool for them! Talk about a perfect ending to a great weekend! I love my little water bugs! They are looking forward to getting back to swim practice tomorrow! I hope you all had a great weekend! Cheers to a great next week! Second Dinner: An Organic Hot Dog with Mustard and Baked Sea Salt Chips. Woke up this morning ready to race! Woke up this morning ready to race. I’ve been looking forward to making it to a time trial for a few months now since I started coaching swim back in February. The races just seemed to always conflict with the Saturday practices. Well now that Summer is here, I finally have time to get the race done and get over to practice. So this morning I was so excited that I was going to get in a time trial before practice. I got all ready the night before. Switched my racing wheels out for my training wheels. Carbo loaded. And got myself all ready to race. 5AM the alarm goes off. I get up and do my race morning stuff. Grab a coffee and head out to the race check in. I pull up and its quiet. No one is there. Not completely unheard of for me to be early to a race, but it was 6:02 and check in is supposed to be at 6. Crickets…. So I hop on Facebook and read closer. July 23rd. Whoops! I have been know to be early, but a month early? SMH Oh well maybe there is a race this month at the old location. So I head over to Bena Rd. and you guessed it …Crickets… At this point I say what the heck! I am heading back to Ming Lake and getting in a training time trial. So back to Ming Lake I go, suit up and head out for my ride. I start out feeling good. I am pushing it, but I figure its only 10ish miles and I can hold on. So I keep pushing. I am moving pretty good through Hart Park but definitely not feeling 100%. After the turnaround there is a little uphill and I hit that and gave it everything. By the top of the uphill I was feeling the burn. Coming down the other side and into a section that I usually move pretty good through I couldn’t find the extra gear. That issue haunted me through the rest of the ride. Even though I feel like I crawled across the finish line, I did so with my second fastest recorded time since September of 2012. I’ll take it! After my ride I decided to eat some crappy food before heading to swim practice. Bad idea. Always a bad idea to eat McDonalds. I jumped into the water during practice and swam about 300 meters. No fun but totally necessary. After practice I headed to my parents’ to help with some yard work. Pretty full day! Workout: Rode 12.5 Miles used Acid Check Granules, Himalayan Pink Salt mixed in water.